It's happening but domestic violence industry operatives still propagandize and evern lie about reality. A new graphic Australian television ad shows children trembling beneath a table while a big bad white guy threatens a woman and throws things against a wall. So why didn’t they show a wild-eyed, spit spewing, finger-nail clawing, foul mouthed, tattooed, out of control modern women? Health Minister Kon Vatskalis said the ad showed the reality of reported assaults of which 50% were related to domestic violence. So they could have showed a bitching, spit spewing, buff Barbie with a graduate degree in WoMEN StuDIEs traumatizing the children and shredding the kitchen? Vlatskails: “We wanted to show exactly what domestic violence is.” Ok, so why not show a border line disordered psycho whacko woman beating the crap out of a guy, particularly since in Australia arguably more women beat men than men beat women (similar to other places). The ads target men and encourage them to think about their behavior, maybe get some pro help with their anger, so someone said. Looks like Oz isn’t really concerned about violent women getting help with their anger (similar to other places) … must be a guy thing, especially for those blokes blind and deaf to reality, maybe like this Vlatskails guy. Does he get paid? I guess so, he must be getting a chunk of the $15 million he scored to target domestic violence and booze. I’m sure he gets a good chunk of that as long as he tows the feminist line, meaning “all men bad, all women good”. There goes tipping a cold Fosters. I’ll miss those. I live in California where these man-bad ads will be running on a local cable station soon (similar to other places, you just wait, it’s amazing how far garbage can travel on $15 million). Valskalis would not say how much the ads cost to produce or who the wankers were that produced it (pretty similar to other places and domestic violence organizations that hide their expenditures). This guy, I think it’s a guy, Valskalis apparently said that using two white guys in the ads – as the big bad brutes – was not a deliberate decision (similar to other places inadvertently and unconsciously not making deliberate decisions to use big bad brutes white guys for domestic violence propaganda ads). To reinforce Mr. Valskalis’s honesty about not making a deliberate decision to use only white guys as brutes, victims used in the ads come from diverse backgrounds (various colors except maybe… well, you probably already guessed by now, true white – similar to other places sometimes). So, if these sods lie about using the white guys it’s a good bet they lie about domestic violence too, come to think of it, that’s what they did (just like in most other places). THE latest series of graphic domestic violence TV ads ask men who use violence to “stop the hurting . . . start the healing” – as they should. But the largest Australian survey of young people and domestic violence found that 21 per cent of young people aged 12 to 20 in the NT have witnessed physical male to female parental violence, while 26 per cent have witnessed female to male violence (ie they are 24 per cent more likely to have seen mum/stepmum hitting dad/stepdad than the other way around). 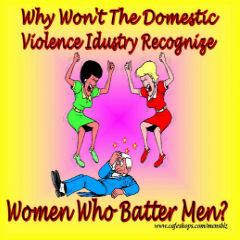 The Government should also release ads advising women who use violence to seek help.